Well, here is another story of a player who performed well enough to receive a major contract only to disappoint the fans. Ville Leino was placed on waivers earlier this week and the Buffalo Sabres will use one of their 2 compliance buyouts to get rid of him. Ville Leino was able to get the big contract after having a career season with the Philadelphia Flyers in 2010-2011. He had 19 goals and 34 assists in 81 games played. The Sabres, looking for some scoring, signed Leino to a 6 yr- $27 million deal. Unfortunately, Leino was never able to replicate that type of production in Buffalo. In 3 seasons with the team, he scored 10 goals and tallied 36 assists in 137 games. Most notably, he did not score a goal during the 2013-2014 season. Every NHL team is allowed two compliance buyouts before July 1st of this year as part of the agreement made in the latest CBA formed after the 2012 NHL lockout. Basically, a team can buyout a player and it will not count toward their salary cap. With the buyout, the Sabres will be about $18 million below the cap floor. It will be interesting to see who the Sabres sign and who they overpay in the process. Defensemen Tyler Myers ($5.5 million) and forward Cody Hodgson ($4.25 million) are the two higheset paid players on the team. 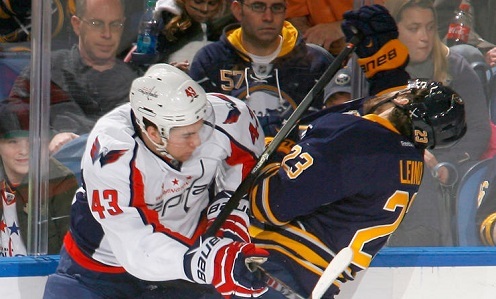 Will Leino latch on anywhere? He will need to show he can score and he most certainly will not be making $4 million/year. Perhaps he plays for under $1 million or takes his skills (whatever they may be) to Europe.